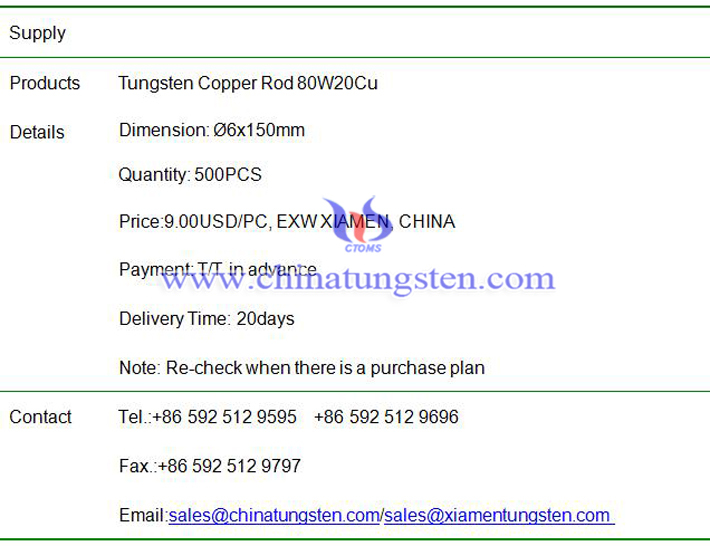 Ø6x150 80W20Cu tungsten copper rod price is 9.00USD/PC on Mar. 27, 2019, EXW, Xiamen, China. The combination of tungsten and copper makes the tungsten copper rod to be good material for EDM rod for welding. As reported by Chinatungsten Online, the current price of 85%W15%Cu tungsten copper sheet of 11mmx60mmx30mm is $22.00 per piece EXW Xiamen, China on Mar.01, 2019. The MOQ of tungsten copper sheet is 10 pieces, the general tolerance of length is +/-2mm, the tolerance of width and thickness is +/-0.3mm. The reference density of 85%W15%Cu is 15.90g/cm3, the composition tolerance is +/-2%wt, the reference hardness is 240HB. As reported by Chinatungsten Online, the current price of 75%W25%Ag tungsten silver rod of Ø6mmx300mm is $16.00 per piece EXW Xiamen, China on Feb.27, 2019. The MOQ of tungsten silver rod is 10 pieces, the general tolerance of length is +/-2mm, the tolerance of diameter is +/-0.3mm. The reference density of 75%W25%Ag is 14.90g/cm3, the composition tolerance is +/-2%wt, the reference hardness is 183HB. As reported by Chinatungsten Online, the current price of 72%W28%Cu tungsten copper bar of 169mmx30mmx3.15mm is $16.00 per piece EXW Xiamen, China on Feb.25, 2019. The MOQ of tungsten copper bar is 20 pieces, the general tolerance of length and width is 0/+0.5mm, the tolerance of thickness is 0/+0.05mm. The reference density of 72W28Cu is 14.20g/cm3, the composition tolerance is +/-2%wt, the reference hardness is 183HB. As reported by Chinatungsten Online, the current price of 75%W25%Cu tungsten copper tube of Ø5mmxØ1.5mmx175mm is $16.00 per piece EXW Xiamen, China on Feb.21, 2019. The MOQ of tungsten copper tube is 10 pieces, the general tolerance of the diameter is +/-0.05mm, and the length tolerance is 0/+2mm. The reference density of 75W25Cu is 14.8g/cm3, the composition tolerance is +/-2%wt, the reference hardness is 190HB. As reported by Chinatungsten Online, the current price of 85%W15%Cu tungsten copper rod of Ø1mmx200mm is $3.50 per piece EXW Xiamen, China on Feb.19, 2019. The MOQ of tungsten copper rod is 100 pieces, the general tolerance of the diameter is ±0.05mm, the length tolerance is 0/+2mm. The reference density of 85W15Cu is 15.60g/cm3, the reference hardness is 235HB, the reference conductivity is 32%IACS. As reported by Chinatungsten Online, the current price of 75%W25%Cu tungsten copper rod of Ø3mmx200mm is $5.00 per piece EXW Xiamen, China on Feb.13, 2019. The MOQ of tungsten copper rod is 50 pieces, the general tolerance of the length is 0/+2mm, the diameter is 0/+0.5mm. The reference density of 75W25Cu is 14.50g/cm3, the reference hardness is 180HB, the conductivity is 35IACS%. As reported by Chinatungsten Online, the current price of 60%W40%Cu tungsten copper block of 50mmx50mmx20mm is $35.00 per piece EXW Xiamen, China on Feb.11, 2019. The MOQ of tungsten copper block is 5 pieces, the general tolerance of the length and width is 0/+1mm, the thickness tolerance is 0/+0.2mm. The reference density of 60W40Cu is 12.75g/cm3, the reference hardness is 140HB, the reference conductivity is 47%IACS. As reported by Chinatungsten Online, the current price of 85%W15%Ag tungsten silver rod of Ø2mmx50mm is $6.00 per piece EXW Xiamen, China on Jan.24, 2019. The MOQ of tungsten silver rod is 100 pieces, the general tolerance of length is +/-0.1mm, the tolerance of diameter is +/-0.05mm. The reference density of 85%W15%Ag is 16.8g/cm3, the composition tolerance is +/-2%wt, the reference hardness is 255HB. As reported by Chinatungsten Online, the current price of 90%W10%Cu tungsten copper sheet of 300mmx200mmx0.5mm is $300.00 per piece EXW Xiamen, China on Jan.22, 2019. The MOQ of tungsten copper sheet is 10 pieces, the general tolerance of length and width is +/-0.1mm, the tolerance of thickness is +/-0.05mm. The reference density of 90%W10%Ag is 16.8g/cm3, the composition tolerance is +/-2%wt, the reference hardness is 255HB.